The previous chapter, Gathering Zen Report Data, explained how to generate and organize the XML data upon which the Zen report is based. This chapter explains how to write a specification for displaying this data. The specification consists of an XData ReportDisplay block in the Zen report class. An XData ReportDisplay block contains a single <report> element. <report> contains additional elements that define the report display. You can omit the XData ReportDisplay block entirely, if you provide a valid value for the HTMLSTYLESHEET and XSLFOSTYLESHEET class parameters. For details, see the section Class Parameters for Zen Reports. If you provide both an XData ReportDisplay block and parameter values, the parameter values take precedence. You can also omit XData ReportDisplay if you only plan to use this Zen report class to generate XML data files. In order to write an XData ReportDisplay block you must understand XPath expressions. Many reference books and user guides for XPath are available on the Web and through commercial publishers. Elements in the XData ReportDisplay block specify the formatting of data on the page. The display elements use XPath expressions to identify the data they are formatting. The following figure shows the XML data source on the right, and the XPath expressions required to access the data on the left. The XML in this figure is that generated by the XData ReportDefinition block of ZenApp.MyReport in the SAMPLES database. You can see the XML output if you run the report with the output mode set to XML using $MODE. See the chapter, Gathering Zen Report Data, for more information on generating XML from data in the Caché database. /nodename  Selects the root element named nodename. /nodename/subnode  Selects all child elements of nodename named subnode. /nodename/subnode/@attrname  Selects all attributes of /nodename/subnode/ named attrname. All other XPath expressions in the report are evaluated in the context of this root node. This identifies the data value of the month attribute of <myReport> in the XML. This identifies all the <SalesRep> elements which are children of <myReport>. <SalesRep> is a container for attributes and elements. The first <table> inside the <group> container contains several <item> elements. This identifies the data value of the name attribute of <SalesRep>, a child of <myReport>. This identifies the data value of the <count> element, a child of <SalesRep>, which is in turn a child of <myReport>. This identifies the data value of the <grandTotal> element, a child of <myReport>. Every element in the XData ReportDisplay block supports the id attribute. If you set a value for an element’s id attribute in XData ReportDisplay, you can later access the element programmatically on the server side before displaying the report. To do this, make your server-side code call the class method %GetComponentById(id) to retrieve a pointer to the object. Then you can access the properties of the object to change them as needed. This can be especially useful to make last-minute adjustments to the value of the content property, whose value is the text contents of elements that contain text, such as <link>, <inline>, <p>, or <write>. For details about callback methods like OnAfterCreateDisplay(), see Executing Code Before or After Report Generation in the chapter Building Zen Report Classes. An XData ReportDisplay block allows you to specify sizes (widths, heights, lengths, etc.) in a variety of units, just as you would in HTML or XSL-FO syntax. "2in", "5cm", "12px", "14pt", "3em", or "75%" are all valid formats for length values in Zen reports. This chapter uses the term HTML length value to describe length values that use these formats. Generally, Zen measures percentages with respect to the parent container for the element whose size is being specified as a percentage. In Zen report tables, using percentage values to specify proportional column widths works only for PDF output. Percentages do not work as width specifications for tables in Zen report HTML output. If you are taking advantage of any automatic Zen calculations for portions of your page layout, do not use "%", "em", or "px" in the HTML length values that you provide for height, margin, or extent attributes in your <document> element. Rather than the default North American number format (76,543,212,345.67), it is possible to set output conventions to a European number format (76.543.212.345,67) or any other alternative that you prefer. To accomplish this, you need to add a simple XSLT instruction to your Zen report as described in the <init> section, later in this chapter. If you set style="none" for the top-level <report> element in XData ReportDisplay, the standard Zen stylesheet is ignored and there are no predefined styles for Zen reports. However, if you omit the style attribute for <report>, your reports use the standard stylesheet for Zen reports. This stylesheet is a collection of predefined style classes. The appendix Default Format and Style describes the default styles for HTML and XSL-FO output in detail. Zen reports creates report output in both HTML and PDF. When you produce reports in PDF, you may want to control how the report is formatted on the printed page. The section The <document> element and Page Layout describes how to use the <document> element to format Zen reports for PDF output, and includes a description of some of the underlying XSL-FO syntax. For many reports, the <document> element, with the <pageheader> <pagefooter>, <pagestartsidebar>, and <pageendsidebar> elements, provides sufficient formatting capability. Zen reports also supports the XSL-FO writing-mode attribute, which is necessary for creating appropriate page layout for languages such as Arabic and Hebrew which are written in a right-to-left direction. See the section Writing Mode. The Zen reports <document> element lets you set the values of XSL-FO attributes that control the layout of PDF output pages. You can omit <document> element from a <report>, even if you intend to produce PDF output. The result is a default PDF page layout: an 8.5 x 11 inch page, in portrait mode, with 1.25 inch left and right margins and 1 inch top and bottom margins. If you want to include <class>, <cssinclude>, and <xslinclude> elements to define styles, you must provide a <document> element to contain them, even if you are not providing any <document> attributes to define page layout. If you include more than one <document> element in the <report>, Zen uses the contents of the first <document> element and ignores any others. To understand how <document> attributes work, you must first understand XSL-FO. There are excellent sources of XSL-FO information available on the Web and in bookstores. However, a few basic elements and concepts are critically important and deserve a brief overview here. <fo:simple-page-master> defines a page layout template. Zen reports adds a single <fo:simple-page-master> element to the generated XSL-FO, which applies the same layout to all pages in the report. There are additional Zen reports elements that allow you to add multiple <fo:simple-page-master> elements to a report, providing multiple layouts in a single report. See the section Multiple Display Layouts. page-height: Sets the height of the page. For printing on US letter size paper, this value is 11 inches. page-width : Sets the width of the page. For printing on US letter size paper, this value is 8.5 inches. margin-top: Sets the margin at the top of the page. margin-bottom: Sets the margin at the bottom of the page. margin-left: Sets the margin at the left of the page. margin-right: Sets the margin at the right of the page. margin: Sets all four margins to the same value. margin-top: Sets the margin at the top of the region-body. margin-bottom: Sets the margin at the bottom of the region-body. 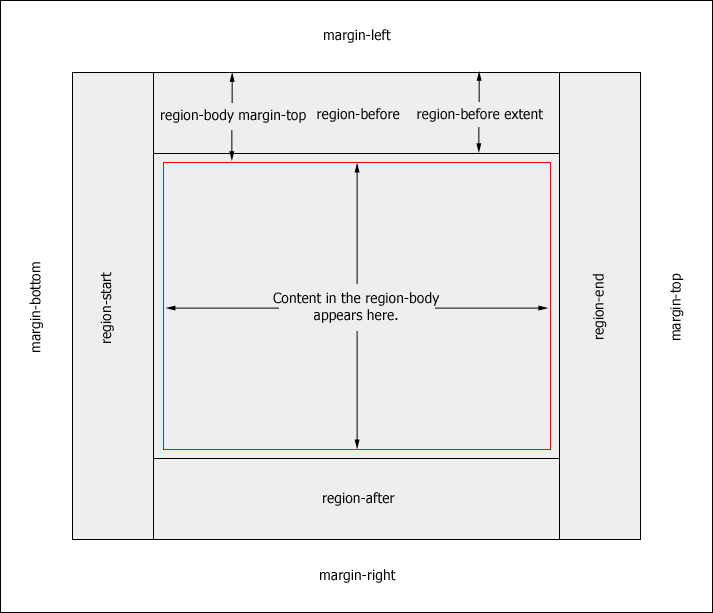 margin-left: Sets the margin at the left of the region-body. margin-right: Sets the margin at the right of the region-body. <fo:region-before>: Places content before the region-body content. On a page in portrait orientation, this is a page header. <fo:region-after>: Places content after the region-body content. On a page in portrait orientation, this is a page footer. <fo:region-start>: Places content on the side of the region-body content where reading of that content starts. On a page in portrait orientation, formatted for a language read left to right. this is a left sidebar. <fo:region-end>: Places content on the side of the region-body content where reading of that content ends. On a page in portrait orientation, formatted for a language read left to right. this is a right sidebar. The extent property determines the width of <fo:region-start> and <fo:region-end>. Their height is the is the height of <fo:region-body>. The width of <fo:region-before> and <fo:region-after> is the distance between <fo:region-start> and <fo:region-end>. Their height is determined by the extent property. Content printed in these regions occupies space allocated for it by the margin attributes of <fo:region-body>. For this reason, the margins applied to <fo:region-body> must be at least as large as the extent attribute of the corresponding region. If they are not, the printed content can overlap. The image represents an 8.5 by 11 inch page. The gray area represents the <fo:region-body> area of the page. Its dimension are determined by the margins set on <fo:simple-page-master>. 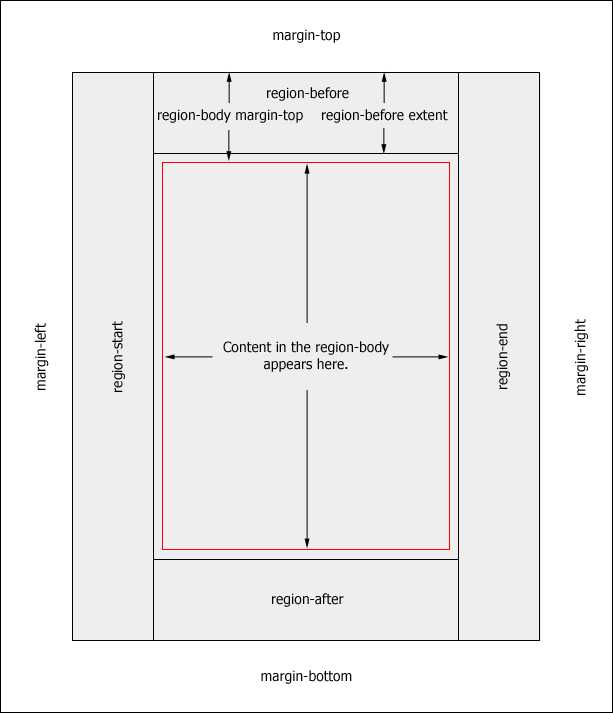 The <fo:region-body> area also has margins, represented by the red lines in this diagram. These margins define the portion of <fo:region-body> that contains content. The <fo:region-*> areas are arranged within the <fo:region-body>. The distance these areas extend into the region-body area is determined by their extent properties. The page has rotated 90 degrees clockwise, so that the top edge is now at the right. The before, after, start, and end region elements are repositioned so that they maintain their relationship to the content in the body region. The page margins are not repositioned. For an important note about viewing design changes as you work on PDF layout, see the introduction to the <document> section. You may need to create a report that has different page margins or regions for the first page, last page, and intervening pages of the report. To achieve this, you add a <pagemaster> element as an immediate child of <report>, and add a <masterreference> element for each page position in the report that needs different formatting. The <masterreference> element contains the <document>, <pageheader> <pagefooter>, <pagestartsidebar>, and <pageendsidebar> elements that would otherwise be direct children of <report>. Add a <pagemaster> element to the report. It must be an immediate child of <report>. Add a <masterreference> element for each separately formatted section of the report. In this example, two <masterreference> elements are required, one for the first page, and one for the remaining pages. The <masterreference> for the first page sets the properties masterReference and pagePosition to first. masterReference could have any string value, but first is a useful mnemonic. The <masterreference> for the first page contains a <document> element with headerHeight specified as 2.0in, which provides a larger header on the first page to accommodate the title and general information. It also contains a <pageheader> element that contains the title banner, and the table of general information about the report. The <masterreference> for the second page sets both masterReference and pagePosition to rest. masterReference could have any string value, but rest is a useful mnemonic. The <masterreference> for the second page contains a <document> element with headerHeight specified as .75in. This is sufficient for the single line header containing Sales Report and the page numbers. Note that this configuration puts page numbers only the pages identified as rest. You may need to create a report that displays page numbers, and starts page numbering from 1 for each element of a group. <Sales> organizes information by SalesRep. <ByNumber> organizes sales data by number of sales. <ByDate> organizes sales data by date of sale. The display section for the <Sales> element in the generated XML is similar to the report that resets the page count, described in the section Resetting the Page Count for Each Element of a Group, but there are some differences worth noting. Inside each <masterreference> element, the same <document>, <pageheader>, and <pagefooter> elements you use to format pages in a <report>, format the pages controlled by the <masterreference>. This part of the example uses only <document> and <pageheader>. Total page count for each section is controlled by the genLastPageIdOn value @name. The primaryGroup for this section is <ByNumber>. This means that page numbering starts at one at the beginning of the <ByNumber> group in the generated XML, and continues to the end of the group, rather than restarting for each element of the group as the report for the <Sales> section did. The <pagemaster> element contains <masterreference> elements for the first, last, and rest page positions. The layouts for the last, and rest page positions do not include a page header. Note that the <pageheader> element must be present, even if it is empty. This is also true for the <document> element. Page numbering is controlled by the XPath value NumbRecs, which is an element of the primary group <ByNumber>. Total page count is controlled by the genLastPageIdOn value NumbRecs. The display section for the <ByDate> element in the generated XML is similar to the section for <ByNumber>. Some primary difference is that no page breaks are generated within the section, so the keepCondition attribute of <foblock> keeps the table containing the sales date together with the table containing the corresponding list of sales. The keepCondition attribute is discussed in Keeping Display Components Together. Sometimes you want to ensure that pieces of information in a report, for example, the title of a table and the table it refers to, are not separated by a page break. The XSL-FO standard provides properties of the <fo:block> object, such as keep-together, keep-with-next, and keep-with-previous, that let you control page breaks. The Zen reports element <foblock> and the keepCondition attribute let you use these features in Zen reports. The <foblock> element simply groups elements. You can use the keepCondition attribute to specify a keep condition for the contents of the block. The following example is based on the report ZENApp.MyReport in the SAMPLES namespace. This example assumes you do not want to insert a page break for each new SalesRep, but you also do not want a page break in the table of SalesRep information. You can put the <header> element in an <foblock> with the keepCondition set to keep-together.within-page='always', which forces the table onto a new page if it would otherwise span the page break. Zen reports supports functionality that allows a report to include or exclude elements in a group based on an XPath condition. This approach is different from other methods of conditionally including information, which include all elements in a group, or none of them. Note that you should not include calculations performed on the whole set of elements in the group, because the result does not reflect the selection performed by the ReportDisplay. The attributes primaryGroup, primaryGroupifxpath, and testEachifxpath support both HTML and PDF output. However, pagination, page breaks, and page numbering are not supported in HTML. When you set a primaryGroup for the report, the report processes each of the elements of the primary group, which makes the primaryGroup, rather than the name, the XML context for elements contained by the report. This changes the way you address elements and attributes in the XML. 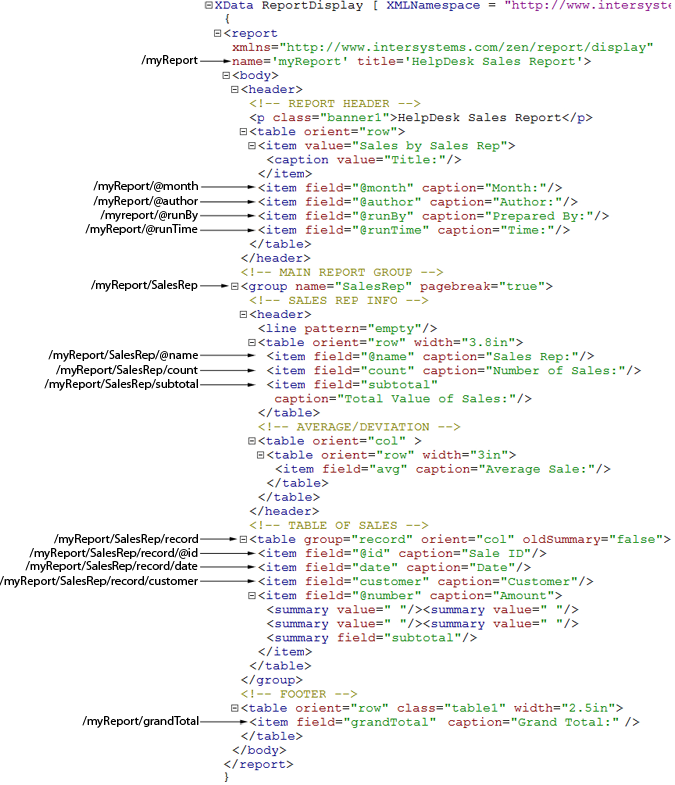 The following lines show how you need to supply a full path to attributes of <myReport>, but not to the name attribute of <SalesRep>. The XML context of the report has not been altered by setting a primaryGroup, so you access elements and attributes in the report in the usual way. The writing-mode attribute controls aspects of page layout that are relevant to the direction in which text is read. For example, in a language read left to right, the first column of a table should be on the left side of the page, but in a language read right to left, it should be on the right side. The ordering of characters in text is controlled by the Unicode Bidirectional Algorithm, which interprets the directional information encoded in the characters, not by the writing-mode attribute. writing-mode does contribute to the proper positioning and orientation of weakly directional characters such as parenthesis and quote marks. Where necessary, the ordering of characters can be fine-tuned with the <bidioverride> element. The following table summarizes the Zen reports elements that support the writing-mode attribute. Adds the writing-mode attribute to the <fo:page-sequence> element, where it sets the writing mode for the entire report. If the report contains multiple <section> elements, adds the writing-mode attribute to the <fo:page-sequence> element generated by each <section>. Adds the writing-mode attribute to the <fo:page-sequence> element generated by the <section>. Adds the writing-mode attribute to the <fo:simple-page-master> element. writing-mode on <document> controls the placement of sidebars. If writing-mode="lr" <pagestartsidebar> is a left side bar and <pageendsidebar> is a right sidebar. If writing-mode="rl" the positions are reversed. Adds the writing-mode attribute to the <fo:block-container> element generated by the <container>. Adds the writing-mode attribute to the <fo:inline-container> element. Adds the writing-mode attribute to the <fo:table> element generated by the <table>. The following two sections list the fonts supported for complex scripts supported for PDF rendering with the supplied FOP rendering engine. Every XData ReportDisplay element except <document> allows its output to be controlled using conditional expressions. If the specified expression evaluates to true, the report displays the element; if the expression evaluates to false, the report does not display the element. The value of the ifexpression attribute is an ObjectScript expression that controls output of the element. If true, the element is output to the report; if false, the element is suppressed. This is January! Cold! Yea! This is later than January! Spring is around the corner! If you use %report in an ifexpression in a way that relies on a property value passed as a ZENURL in the URI that invokes the report, you may see unexpected results if XSLT processing takes place in the browser. See the section Setting Zen Report Class Properties from the URI for more information on this issue. The value of the ifxpath attribute is an XPath expression that controls output of the element. If true, the element is output to the report; if false, the element is suppressed. Because ifxpath is an XPath expression, it must conform to XPath and XML syntax rules. You cannot use the < (less-than) character in comparisons; instead use &amp;lt; which is the XML-escaped XML entity that represents <. The value of the includeColIfExpression attribute is an ObjectScript expression that controls output of a specific column of data to the report. If true, the column is output; if false, the column is suppressed. The expression may not contain private variables. However, you may use the special variable %report to indicate the report class, and dot syntax with %report to reference properties or methods of the Zen report class. If you use %report in an includeColIfExpression in a way that relies on a property value passed as a ZENURL in the URI that invokes the report, you may see unexpected results if XSLT processing takes place in the browser. See the section Setting Zen Report Class Properties from the URI for more information on this issue. The value of the includeColUnlessExpression attribute is an ObjectScript expression that controls output of a specific column of data to the report. includeColUnlessExpression is the logical opposite of includeColIfExpression: If false, the column is output; if true, the column is suppressed. If you use %report in an includeColUnlessExpression in a way that relies on a property value passed as a ZENURL in the URI that invokes the report, you may see unexpected results if XSLT processing takes place in the browser. See the section Setting Zen Report Class Properties from the URI for more information on this issue. The includeColIfXPath attribute is similar to includeColIfExpression, except that its value is an XPath expression rather than an ObjectScript expression. It is also similar to the ifxpath attribute, which controls output of an element rather than a column of data in the report. If the XPath expression evaluates to true, the column is output; if false, the column is suppressed. The includeColUnlessXPath attribute is similar to includeColUnlessExpression, except that its value is an XPath expression rather than an ObjectScript expression. If the XPath expression evaluates to false, the column is output; if true, the column is suppressed. The value of the unlessexpression attribute is an ObjectScript expression that controls output of a specific column of data to the report. unlessexpression is the logical opposite of ifexpression: If false, the column is output; if true, the column is suppressed. In the following example, the item is always output except when GroupOption is null; then it is suppressed. Note that you cannot enclose string arguments to concat and other XPath functions, in single quotes. You need to use double quotes or the &quot entity. If you use %report in an unlessexpression in a way that relies on a property value passed as a ZENURL in the URI that invokes the report, you may see unexpected results if XSLT processing takes place in the browser. See the section Setting Zen Report Class Properties from the URI for more information on this issue. ObjectScript expression whose result appears in the report output if the if condition is true. ObjectScript expression that controls output of the expression result. If the if expression evaluates to true (any non-zero value in ObjectScript), the expression result is output to the report; otherwise the expression result is not output. The default value for if is 1 (true). If you do not specify a value for if, the element always outputs the expression result. The <p> and <inline> elements behave differently from the <item> element when they combine the content from the expression attribute with other content. For a <p> or <inline> element, content can be provided by text contained in the element, by the field attribute, and conditionally by the expression attribute. Content from all three sources is output at the same time. The order in which the contents are arranged is: field, followed by expression, followed by the text content. For an <item> element, content can be provided by the field, special, expression, and value attributes, but <item> outputs content from only one of these attributes to the report. If content is available from multiple attributes, <item> selects the one to output based on the following order of precedence, from highest to lowest: field, special, expression, and value. If an <item> has both an expression, and a value attribute, but the if attribute evaluates to false, the expression still takes precedence over the value, and nothing is output to the report. The following example runs the report from the command line rather than the browser. If you use %report in a way that relies on a property value passed as a ZENURL in the URI that invokes the report, you may see unexpected results if XSLT processing takes place in the browser. See the section Setting Zen Report Class Properties from the URI for more information on this issue. The <report> element is the required top level container within an XData ReportDisplay block. <pagemaster>  Lets you specify formatting for the first page, last page, the rest of the pages, or any page in a report. <document>  Sets page layout for PDF and other styling for HTML and PDF output. <pageheader>  Page header, used in PDF and optionally in HTML. <pagefooter>  Page footer, used in PDF only. <pagestartsidebar>  Page sidebar, on the side of the document where text starts. In languages read left to right, this is a left sidebar. Used in PDF only. <pageendsidebar>  Page sidebar, on the side of the document where text ends. In languages read left to right, this is a right sidebar. Used in PDF only. <body>  The container for elements that control layout, style, and appearance. This element is required. <call>  Calls a method that returns a stream, and inserts the stream into the report definition at the place where the element occurs. This capability lets you create a report from separately-developed subreports. A <report> element that appears in an XData ReportDisplay block has the following attributes. id Optional identifier. If present, it can be used to retrieve this element in server-side code, by calling the %GetComponentById(id) method. Use it In conjunction with the *-with-xpath values for the <item> attribute special and the <body> attribute genLastPageIdOn. Note also that a <group> element with the attribute primaryGroup set to true does not need the attribute pagebreak set to true since the page break happens automatically when the page number resets to 1. An XPath that provides a condition that is applied to each element of the primary group to determine whether the element is included in the report. The report name, which should match the top-level element name in the XML data for the report. If the XData ReportDefinition block from the same Zen report class is used to generate this XML, then the name attribute for the <report> element in XData ReportDisplay should match the name attribute for the <report> element in XData ReportDefinition. If you omit the style attribute, your reports use the standard stylesheet for Zen reports. If you set style="none" the standard Zen stylesheet is ignored and there are no predefined styles for Zen reports. 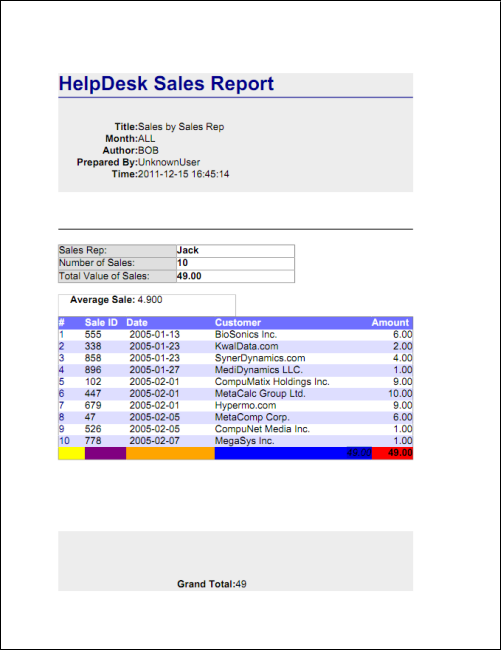 The report title, used for items such as the PDF filename or HTML page title. The special variable %display represents the <report> container in XData ReportDisplay. Properties of the %display object correspond to attributes of the <report> element. Also see the description of %display in the section Using Runtime Expressions in Zen Reports  in this document. The <init> element, if present in the <report>, must occur before the <document> element. <init> provides a way to insert custom XSLT instructions at the top level of the generated XSLT stylesheet for the Zen report, before any other stylesheet processing occurs. Generally, <init> contains only <xslt> elements. In the following example, <init>, <xslt>, and a custom XData block work together to set output conventions to a European number format (76.543.212.345,67) rather than the default North American number format (76,543,212,345.67). The <xslt> element that references this custom XData block would need to appear inside an <init> element in the XData ReportDisplay block for the same Zen report class. In the following example, the <xslt> element uses its all attribute to reference the custom XData block called EuropeanNumberFormat. The all attribute tells Zen that the XSLT instructions in this XData block apply to stylesheets for both HTML and PDF report output. The great advantage of Zen reports is that they generate XSLT for you. However, Zen reports also offer an <xslt> element that enables you to contribute custom XSLT instructions to the generated XSLT. The <xslt> element can appear anywhere within an XData ReportDisplay block, but if you want the resulting XSLT instructions to apply at the top level of the generated stylesheet, place the <xslt> element in the <init> block. For example, <init> is the appropriate container to use when you want your <xslt> element to define values for XSLT global variables. An <xslt> element must identify a custom XData block in your Zen report class. This XData block has its own name, and is distinct from XData ReportDefinition or XData ReportDisplay. This custom XData block contains the XSLT instructions that you want to add to the XSLT stylesheet for your Zen report. Once you have created a custom XData block, your <xslt> syntax must use one of the attributes all, html, or xslfo to identify this XData block. The choice of attribute determines the type of output to which your XSLT instructions apply: all forms of output, HTML only, or PDF only. <xslt> has the attributes described in the following table. all Name of an XData block in the Zen report class that defines XSLT instructions to be used in the generated XSLT stylesheet for all types of output. These XSLT instructions apply to all forms of Zen report output, both XHTML and PDF. For alternatives to the all attribute, see html and xslfo. expressions Semicolon-separated list of one or more expressions that give values to the corresponding variables listed in vars. expressions may be XSLT or ObjectScript expressions. If ObjectScript, the ! (exclamation point) operator must precede them, as in the example. html Name of an XData block in the Zen report class that defines XSLT instructions to be used in the generated XSLT stylesheet for XHTML output only. For alternatives to the html attribute, see all and xslfo. vars A semicolon-separated list of one or more XSLT variables. The expressions attribute provides values for these variables. xslfo Name of an XData block in the Zen report class that defines XSLT instructions to be used in the generated XSLT stylesheet for PDF output only. For alternatives to the xslfo attribute, see all and html. This example uses <init> and <xslt> to pass the value held in the Zen report class Orientation property to an XSLT global variable called orientation. This value can subsequently be referenced using the normal XSLT syntax for global variables, as shown for $orientation, $width, and $height in this and other examples in this section. This XData block example uses a root element called <zenxslt> to contain the XSLT statements. A <zenxslt> container is required when there is no single root for the XSLT statements that you want to provide in the XData block for <xslt>. This allows the complete XData block to contain only one root element, as is appropriate for well-formed XML. At compile time, Zen strips out the <zenxslt> container and adds the XSLT statements to the generated stylesheet for your Zen report. This sample XData block conditionally defines values for XSLT global variables height and width based on the value of the XSLT global variable orientation. The previous topic, <xslt> and its Attributes, shows how you could use <init> and <xslt> elements to give the XSLT variable orientation the current value of the Orientation property of the Zen report class. However, there is no restriction on how the Orientation property gets its value. It might have a default value, or the Zen report class might contain code that sets the value. The next section provides information about how a user might set the value of the Orientation property such dynamically, from the browser URI, when invoking the Zen report. Now suppose you have the <xslt> element shown in <xslt> and its Attributes and the XData block shown in XData Blocks for <xslt>. These work together to set the XSLT global variable orientation to the value of the Zen report class property Orientation and to set appropriate values for the XSLT global variables height and width based on the value of orientation. The following are four examples of URI strings that could set the Orientation property of the Zen report class when the Zen report is invoked. The <section> element lets you create multiple report display definitions in a <report>. It must be an immediate child of <report> And must contain a <pagemaster> element for page formatting. In addition to <pagemaster>, a <section> must contain a <body> element, which in turn contains anything valid in the body of a report. <section> supports most of the same properties as <report>. The additional property sectionName is required, and is used to generate identifiers that are unique in the generated XSL-FO. The <pagemaster> element lets you specify formatting for different pages in the report. It can be a direct child of a <report> or a <section> element. It contains one or more <masterreference> elements. The <masterreference> element lets you specify formatting for specific pages. It must be a direct child of <pagemaster>. <masterreference> can contain <document>, <pageheader> <pagefooter>, <pagestartsidebar>, and <pageendsidebar> elements. The elements must be in order, and you cannot skip any element. For example, if you need to specify only the <document> element, you need not include <pageheader> and <pagefooter>, but if you need to specify only <pagefooter>, you must include both <document> and <pageheader> even if they are empty. Can be an arbitrary string. It is used to create unique identifiers for objects in the sections of the report. Supplies the value of the page-position attribute of the <fo:conditional-page-master-reference> XSL-FO object. Valid values are, first, last, rest, any. The <document> element specifies page layout and style characteristics for PDF output. For an overview of PDF page layout, see the section The <document> element and Page Layout. <document> can contain multiple <class>, <cssinclude>, and <xslinclude> elements. These elements provide custom style specifications. Their results can apply to XHTML or PDF output, separately or equally, depending on your choices within these elements. The corresponding sections in this topic describe <class>, <cssinclude>, and <xslinclude>. Note that as you design a PDF output page, you might try different layouts in rapid succession. If you edit your <document> element to change margin values, adjust headers, or switch from portrait to landscape mode, the next time you view your Zen report, your changes might not display in the PDF output. You might draw incorrect conclusions when your changes do not appear. This can happen due to caching of previously displayed pages, especially in Firefox. To overcome this problem you must fully exit Firefox and start a new Firefox session before viewing the revised Zen report. It is not necessary for you to restart Caché, but you must exit and restart Firefox. The <document> element supports a number of attributes that control aspects of page layout. The following tables present them grouped according to their function. Provides an HTML length value for the margin attribute of the <fo:simple-page-master> element in the generated XSL-FO stylesheet. When you supply a margin value, Zen replaces any values supplied for marginBottom, marginLeft, marginRight, or marginTop with the value supplied for margin. Provides an HTML length value for the margin-bottom attribute of the <fo:simple-page-master> element in the generated XSL-FO stylesheet. When you supply a margin value, it replaces any values supplied for marginBottom, marginLeft, marginRight, or marginTop. marginLeft Sets the left margin, as marginBottom sets the bottom margin. marginRight Sets the right margin, as marginBottom sets the bottom margin. marginTop Sets the top margin, as marginBottom sets the bottom margin. Provides an HTML length value for the margin-right attribute of the <fo:region-body> element in the generated XSL-FO. It defines the area occupied by <fo:region-end>, which contains page footer text. If your report has a <pageendsidebar>, you must specify a endSidebarLength and this endSidebarLength must be greater than the regionEndExtent to ensure that text does not overlap. If your report has no <pageendsidebar>, regionEndExtent and endSidebarLength are optional. The default value of endSidebarLength is 0. The property startSidebarLength performs the same function for <fo:region-start>. "2in", "5cm", "12px", "14pt", "3em", or "75%" are all valid formats for HTML length values. A percentage is relative to the container for the element specifying the length. If you are taking advantage of any automatic Zen calculations for portions of your page layout, do not use "%", "em", or "px" in the HTML length values that you provide for the height, margin, or extent attributes of <document>. Provides an HTML length value for the margin-bottom attribute of the <fo:region-body> element in the generated XSL-FO. It defines the area occupied by <fo:region-after>, which contains page footer text. If your report has a <pagefooter>, you must specify a footerHeight and this footerHeight must be greater than the regionAfterExtent to ensure that text does not overlap. If your report has no <pagefooter>, regionAfterExtent and footerHeight are optional. The default value of footerHeight is 0.
headerHeight Sets the header height as footerHeight sets the footer height. startSidebarLength Defines the area occupied by <fo:region-start> in the <fo:region-body> asendSidebarLength defines <fo:region-end>. Each content area in the <fo:region-body>, the page headers, footers, and sidebars, have a set of similarly-named attributes that control styling and other characteristic of the area. The following table lists the attributes that control the <pagefooter>, which corresponds to the <fo:region-after> element in the generated XSL-FO. Attributes controlling other areas behave similarly. Style to assign to the <fo:region-after> area of the page as shown in the diagrams at the beginning of this section. You can also use the more specific attributes regionAfterColor, regionAfterDisplayAlign, regionAfterExtent, regionAfterName, and regionAfterOrientation. regionBefore, regionStart, and regionEnd perform the same function for <fo:region-before>, <fo:region-start>, and <fo:region-end>. Provides a value for the background-color attribute of the <fo:region-after> element in the generated XSL-FO stylesheet. This can be useful for diagnostic purposes. regionBeforeColor, regionStartColor, and regionEndColor perform the same function for <fo:region-before>, <fo:region-start>, and <fo:region-end>. Provides a value for the display-align attribute of the <fo:region-after> element in the generated XSL-FO stylesheet. before  align with the before edge of the region. center  center in the region. after  align with the after edge of the region. regionBeforeDisplayAlign, regionStartDisplayAlign, and regionEndDisplayAlign perform the same function for <fo:region-before>, <fo:region-start>, and <fo:region-end>. Provides an HTML length value for the extent attribute of the <fo:region-after> element in the generated XSL-FO. The <fo:region-after> element contains the page footer content. The default value is 0. If your report has a <pagefooter>, you must specify a footerHeight and this footerHeight must be greater than the regionAfterExtent or content may overlap. Make sure the regionAfterExtent is large enough to contain the content you plan for your footer. If your report has no <pagefooter>, regionAfterExtent and footerHeight are optional. regionBeforeExtent, regionStartExtent, and regionEndExtent perform the same function for <fo:region-before>, <fo:region-start>, and <fo:region-end>. Provides a name for the region-after area in the region-body. If supplied, this name and the name supplied for the regionName of <pagefooter> should be the same. regionBeforeName, regionStartName, and regionEndName perform the same function for <fo:region-before>, <fo:region-start>, and <fo:region-end>. Supplied named should match regionName on the relevant page element. Controls how content is oriented on the <fo:region-after>. 0  Content is oriented so that the top of the content is at the top of the page. This is the default. 90  Content is rotated 90 degrees counterclockwise. 180  Content is rotated an additional 90 degrees counterclockwise. 270  Content is rotated an additional 90 degrees counterclockwise, for a total rotation of 270 degrees. This rotation is the same as rotating the content 90 degrees clockwise. regionBeforeOrientation, regionStartOrientation, and regionEndOrientation perform the same function for <fo:region-before>, <fo:region-start>, and <fo:region-end>. Specifies number of columns in PDF output. The default value is 1. When the value is greater than one, output is formatted into columns such that content flows from the bottom of the first column to the top of the second and so forth until all columns on the page are filled. Used if column-count is greater than 1. Specifies the space between columns. The value is an explicit length, specified with units such as cm or in. Provides an HTML length value for the page-height attribute of the <fo:simple-page-master> element in the generated XSL-FO. Defines the height dimension of the printed page. Controls how page content is oriented on the page. The orientation of the page itself does not change. "portrait"  Content is oriented so that the top of the content is at the top of the page. This is the default. It is the same as setting referenceOrientation to 0. "landscape"  Content is rotated 90 degrees counterclockwise. If you specify "landscape" for orientation, it is the same as setting referenceOrientation to 90. 0  Content is oriented so that the top of the content is at the top of the page. This is the default. It is the same as setting orientation to "portrait". 90  Content is rotated 90 degrees counterclockwise. This is the same as setting orientation to "landscape". 180  Content is rotated an additional 90 degrees counterclockwise, which results in an orientation like portrait mode upside down. Value for the <fo:simple-page-master> size attribute in the generated XSL-FO stylesheet. Provides an HTML length value for the page-width attribute of the <fo:simple-page-master> element in the generated XSL-FO stylesheet. Defines the width dimension of the printed page. Adds the writing-mode attribute to the <fo:simple-page-master> element in the generated XSL. writing-modecontrols aspects of page layout relevant to the direction in which text is written. See the section Writing Mode for additional discussion of thewriting-mode attribute. lr-tb  for text written left-to-right and top-to-bottom, as in most Indo-European languages. rl-tb  for text written right-to-left and top-to-bottom, as in Arabic and Hebrew. tb-rl for text written top-to-bottom and right-to-left, as in Chinese and Japanese. Note that not all XSL-FO renderers support all possible values. Adds the writing-mode attribute to the <fo:region-after> element in the generated XSL. For details, see the writing-mode property in this table. writing-mode-region-before, writing-mode-region-body, writing-mode-region-end, and writing-mode-region-start perform the same function for <fo:region-before>, <fo:region-body>, <fo:region-end>, and <fo:region-start>. See writing-mode-region-after in this table. The <class> element renders style information into a CSS class in the XHTML report, and into equivalent XSLT stylesheet information for the PDF report. <class> elements can only occur as children of <document>. Multiple <class> elements may be present. Each <class> element has attributes described in the following table. The className portion of the tagName.className value can be any name of your choosing that uniquely identifies this style. The <class> element contains the following elements that specify the styling information for the class. These elements can only occur as children of <class>. <att>, <atthtml>, and <attxslfo> have the following attributes. name The attribute name. This corresponds to a CSS attribute name (color, background-color, font-size, font-family, width, etc). Zen simply passes the <att> attributes on to CSS or XSL-FO, so the user can specify anything; it is up to the browser or PDF rendering tool to be able to interpret the attribute. value The value to assign to the attribute. Parent elements propagate their class attribute values to children that do not have a class specified. So if you define table.myTable, th.myTable, and td.myTable, you only need to give the <table> element a class attribute. You can even put a class attribute on the <body> element to give a class for every element in the report. The <cssinclude> element applies to XHTML output only. When producing the XSLT stylesheet for PDF output, the class simply ignores any <cssinclude> elements. Multiple <cssinclude> elements may be present within a <document> element. Each <cssinclude> element has the attribute listed in the following table. URI of an external CSS stylesheet to include in the HTML stylesheet. The href string can be a comma-separated list of URIs, and each is included; this the same as providing multiple <cssinclude> elements. Some browsers struggle when the file referenced does not end in .css. If true, and %request is not defined, convert the filename supplied by href to an absolute URL that points to a file in csp/namespace in the Caché installation directory. The <xslinclude> element applies to the XSLT stylesheet for PDF output only. When producing the HTML version of the report, the class simply ignores any <xslinclude> elements. Multiple <xslinclude> elements may be present within a <document> element. Each <xslinclude> element has the attribute listed in the following table. Filename of an external XSLT file to include in the to-XSLFO stylesheet. This feature is potentially very powerful, but XSLT can be difficult to write. In practice, the main purpose of the <xslinclude> element is for the external XSLT stylesheet to contain <xsl:attribute-set> elements, which can do the same work as CSS classes. The <pageheader> element puts content into a header at the top of each printed page. You must place it before the <body> element in the XData ReportDisplay block. A <document> element with headerHeight and regionBeforeExtent values. The headerHeight must be greater than the regionBeforeExtent. Make sure the regionBeforeExtent is large enough to contain the content you plan for your header. XHTML reports do not support page-by-page headers, so in XHTML reports the contents of <pageheader> are simply rendered at the beginning of the report. The <pageheader> element supports the attributes listed in the following table. A name for the <pageheader>. If supplied, this name and the name supplied for regionBeforeName in <document> must be the same. The <pagefooter> element puts content into a footer at the bottom of each printed page. You must place it before the <body> element in the XData ReportDisplay block. A <document> element with footerHeight and regionAfterExtent values. The footerHeight must be greater than the regionAfterExtent. Make sure the regionAfterExtent is large enough to contain the content you plan for your header. XHTML reports do not display <pagefooter> elements at all. The <pagefooter> element supports the attributes listed in the following table. A name for the <pagefooter>. If supplied, this name and the name supplied for regionAfterName in <document> must be the same. The <pagestartsidebar> element puts content into a sidebar on each printed page. The sidebar is positioned on the side of the page where text starts. In a language read left to right, <pagestartsidebar> creates a left sidebar. If you set writing-mode="rl" on the <document> element, sidebars switch sides, and <pagestartsidebar> creates a right sidebar. 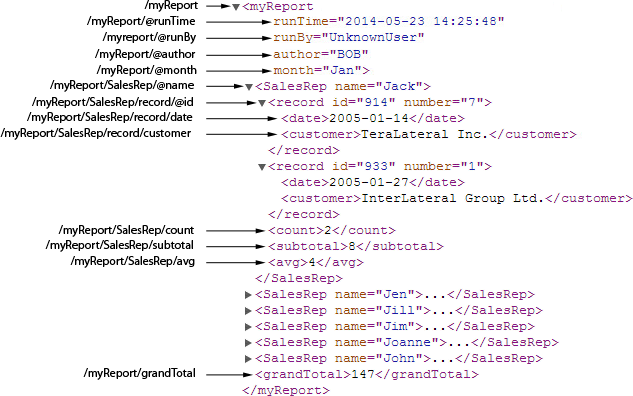 You must place it before the <body> element in the XData ReportDisplay block. <pagestartsidebar> can contain the same layout and display elements as <body>. See the list of elements in the chapter Displaying Zen Report Data. However, everything contained within the <pagestartsidebar> is rendered in the blank space provided by the <document> element startSidebarLength and regionStartExtent attributes. A <document> element with startSidebarLength and regionBeforeExtent values. The startSidebarLength must be greater than the regionStartExtent. Make sure the regionStartExtent is large enough to contain the content you plan for your header. 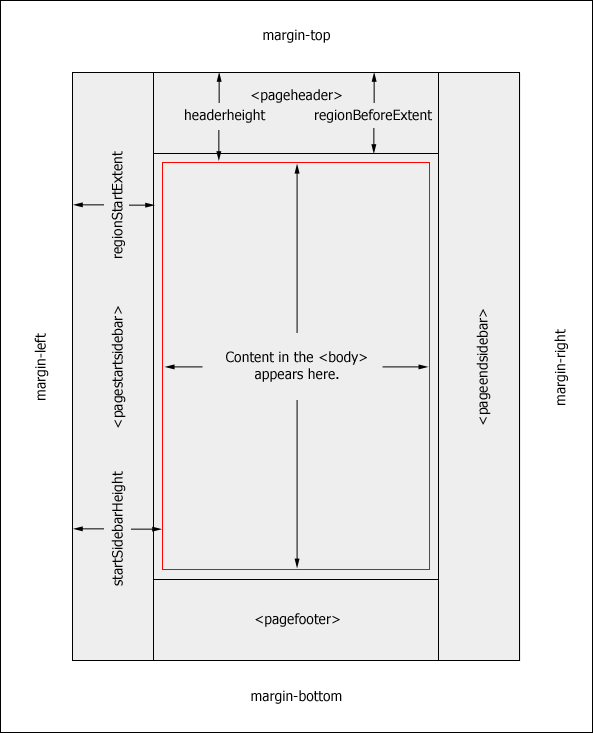 The figure <document> Attributes for Page Layout in Portrait Mode illustrates these relationships. HTML report output does not display <pagestartsidebar> elements at all. The <pagestartsidebar> element supports the attributes listed in the following table. A name for the <pagestartsidebar>. If supplied, this name and the name supplied for regionStartName in <document> must be the same. The <pageendsidebar> element puts content into a sidebar on each printed page. The sidebar is positioned on the side of the page where text ends. In a language read left to right, <pageendsidebar> creates a right sidebar. If you set writing-mode="rl" on the <document> element, sidebars switch sides, and <pageendsidebar> creates a left sidebar. You must place <pageendsidebar> before the <body> element in the XData ReportDisplay block. <pageendsidebar> can contain the same layout and display elements as <body>. See the list of elements in the chapter Displaying Zen Report Data. However, everything contained within the <pageendsidebar> is rendered in the blank space provided by the <document> element endSidebarLength and regionEndExtent attributes. A <document> element with a endSidebarLength value. This endSidebarLength must be greater than the regionEndExtent for the <document>. Make sure the regionEndExtent is large enough to contain the content you plan for your header. The figure <document> Attributes for Page Layout in Portrait Mode illustrates these relationships. XHTML reports do not display <pageendsidebar> elements at all. A name for the <pageendsidebar>. If supplied, this name and the name supplied for regionEndName in <document> must be the same. The <body> element is the required child of <report>. It contains the Zen report elements that control layout and style. The <body> element supports the attributes listed in the following table. In order to calculate a total page count, Zen reports generates a last-page marker. A report that has multiple, independently numbered sections, effectively has more than one ‘last’ page. This attribute instructs the report to use the value supplied by the <body> attribute id to generate a unique last-page marker. Use it in conjunction with the <item> attribute appendToZenLastPage. The value of appendToZenLastPage must match the value supplied for <body> id. See the section Page Numbering in Multi-section Reports for more information on using the appendIdToZenLastPage attribute. Boolean flag to block last page reference creation. Default value is false. It provides a useful ‘shortcut’ to avoid the necessity of generating unique last-page markers if you are not using page numbering in your report. In order to calculate a total page count, Zen reports generates a last-page marker. A report that has multiple, independently numbered sections, effectively has more than one ‘last’ page. This attribute provides an XPath that is used to generate unique last-page markers. Use it in conjunction with the *-with-xpath values for the <item> attribute special, and the <report> or <section> attribute primaryGroup. The foStyle attribute does not apply to output in XHTML format. When the output mode is XHTML, foStyle is ignored. The <call> element allows a report display to include XSLT created by the XData ReportDisplay block of another report. It is useful if you want to create a report from separately developed sub-reports, or if a report becomes too large to compile. The <call> element must be a direct child of the <body> element. A called subreport cannot contain a <call> element. The report property suppressRootTag can be useful with <call> if the included XSLT has its own root tag. The method can return the output of the XData ReportDisplay block of a subreport, or it can perform other functions. If used with a subreport, the method must create a new instance of the subreport, and use GenerateStream to return a stream. You must write the method to accept a mode argument even though the <call> element does not pass this argument explicitly. The value of mode is handled automatically by Zen reports, and is determined by the output mode of the report. If the method is also called from a ReportDefinition block, mode is not set automatically, and you must set it to 0 in the method. Provides a string used in the generated XSLT to identify a set of formatting instructions. It enables the generated XSLT to process the same XML more than once, and produce different results each time. The method must set the SubReport property to the same string as subreport. The subreport attribute must be unique in the report, so that each set of formatting instructions is uniquely identified. The value of this attribute is the value of the name attribute of the report element of the XData ReportDisplay block of the subreport called by this <call> element. This value enables the generated XSL to select the correct nodes in the generated XML. If the report also calls subreports in the XData ReportDefinition block, <report> element in the ReportDefinition block of those subreports must also use this name. If the first character in the subreportname string is a ! (exclamation point) then Zen reports interprets the remainder of the string as an ObjectScript expression that provides the string. You can set the report name from a property in the report, and define the property as a ZENURL and set it at runtime from the URL that invokes the report. Because the ObjectScript is evaluated in the context of the <call> element, if the expression involves executing a method in the main report, you must prefix the method name with %report. A different <call> element is used in the XData ReportDefinition block. The method used to call a subreport from the ReportDisplay block is essentially the same as the method used with <call> in the ReportDefinition block. Methods called from the ReportDisplay block must take a mode argument, and must pass mode to GenerateStream. Zen reports automatically provides the value of mode. In this example, the method GetSummary calls the report ZENApp.MyReportSummary.cls, and GetDetail calls ZENApp.MyReport.cls You can include mode in the signature of methods called from the ReportDefinition block, but the method must provide a default value, because none is supplied automatically by Zen reports. The subreport attribute provides a character string used by the XSLT to identify the formatting commands generated by each subreport. It enables the Zen report to process the XML more than once, generating different output each time. In the method, you must also set the property SubReport of %ZEN.Report.reportPage to the same value as subreport. The SAMPLES namespace provides a code example in the ZENApp package that illustrates the use of <call> in both the ReportDefinition block and the ReportDisplay block. The Zen report class ZENApp.MyReportBoth.cls creates a composite report from the subreports ZENApp.MyReportByDay.cls and ZENApp.MyReportByRep.cls. The ReportDefinition block of ZENApp.MyReportBoth.cls calls the methods GetSubDaily and GetSubRep, which each call a subreport to generate the XML for the report. The previous section Example using the <call> element discusses this type of call. The ReportDisplay block of ZENApp.MyReportBoth.cls calls the methods GetSubDailyDspl and GetSubRepDspl. The way <call> is used here is similar to what you saw in the section Example using the <call> element in ReportDisplay, but with an additional attribute called subreportname. The value of this attribute is a string that must match the name attribute of the <report> element of the ReportDisplay block in the subreport. Zen reports uses this name to locate nodes in the XML generated by the subreport. The methods GetSubDailyDspl and GetSubRepDspl also set the value of %ZEN.Report.reportPage.MainReport to the name of the main report, which is also the top-level element in the generated XML. The following code shows GetSubDailyDspl with MainReport set. The subreportname attribute and the value of MainReport provide the generated XSLT by the information required to find elements in this two-level structure. The following figure shows how the MainReport property of the report, and the subreportname attribute of <call> correspond to the top and second level elements in the generated XML. The difference is that everything contained within <fo> is rendered in the XSL-FO (that is, PDF) report only. <fo> is useful for correcting issues where the XHTML report and PDF report do not look alike due to inherent page differences, such as page breaks. (Optional) Caption text for this block. The <foblock> element becomes an <fo:block> in generated XSL-FO. You can use it to group elements in a report for formatting, such as applying block-level styling to a group of <inline> components. It keeps all content within the <foblock> together on a single page. The <html> element supports the same elements and attributes as <fo>, but <html> renders its contents in the XHTML report only. The <write> element supports the attributes listed in the following table. id Optional identifier. You can use the id to access the <write> element to change its contents programmatically. For details, see the discussion of the content property following this table.